Stationary – MoonFigures Collection, Art, and Reviews! These are Japanese stationary envelopes. I’ve received several of them free with items, or as bags holding the items I was purchasing. Purchased From: Lovehaze on Livejournal in 2010. This is an official note book made by Seika Note Co.LTD in Japan. It features the 5 inner scouts as seen in Sailor Moon R. Inside it reads “Pretty Soldier Sailor Moon R; Usagi, Ami, Rei, Makoto, and Minako, with a small image of Sailor Moon in the bottom right corner, and some copyright information. The back features the Official TOEI sticker with a “10” in the corner. This is an official Korean Sailor Moon notebook by Elite Co. I believe it’s either Classic or R, but I do not read Korean, nor do I know their logos for the series. The front features Sailor Venus in a large red oval, with the other 4 inner scouts in front. Inside features the Sailor Moon logo in the top right corners, Sailor Moon in the bottom right corners, and copyright information on the bottom. 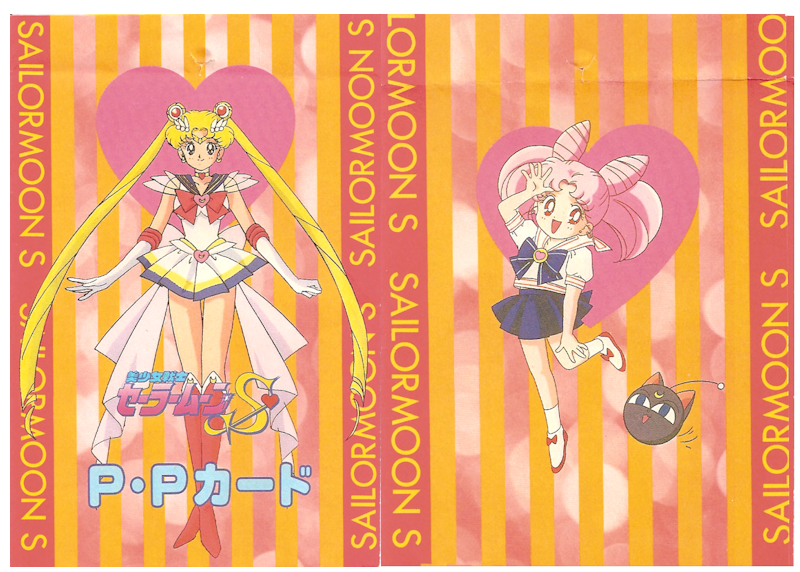 The back shows all 5 Scouts together with a misprint spelling Sailor Moon as “Salior Moon” placed in a ribbon bellow them. There is also the correct copyright info below stating “(C) 1992 Naoko Takeuchi/K.T.A. This is an official Korean Sailor Moon notebook by Elite Co. I believe it’s either Classic or R, but I do not read Korean, nor do I know their logos for the series. The front features the 4 inner Scouts in a large orange oval, with Sailor Moon, Mercury, Mars, and Jupiter in front. Inside features the Sailor Moon logo in the top right corners, Sailor Moon in the bottom right corners, and copyright information on the bottom. 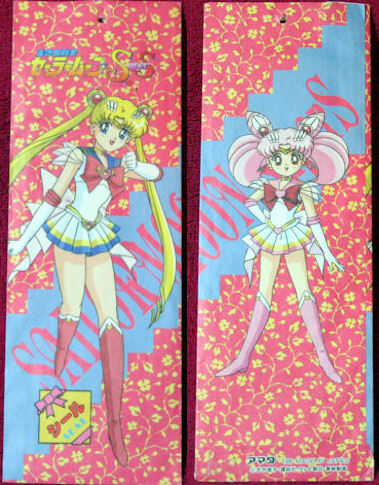 The back shows all 5 Scouts together with a misprint spelling Sailor Moon as “Salior Moon” placed in a ribbon bellow them. There is also the correct copyright info below stating “(C) 1992 Naoko Takeuchi/K.T.A. This is another Seika Note Co.LTD note book from Japan, although for some reason this one doesn’t feature the regular TOEI sticker. 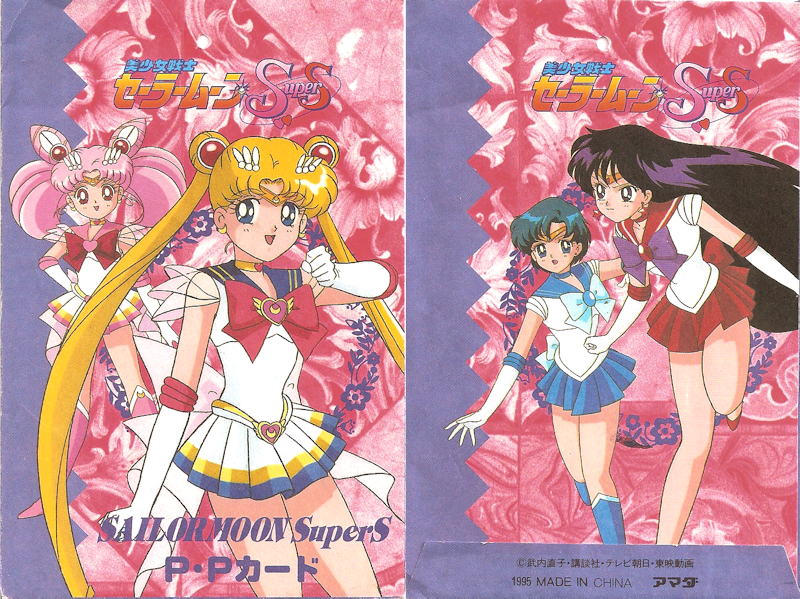 The cover features colourized inner Scouts in their own colour respectively, as well as Sailor Moon who is coloured normally. In front of her is Usagi attaching an earring to her ear. In front of her are the words “Fight for Love and Justice. Pretty Soldier Sailor Moon S”. The inside pages are red and blue, with pictures of each of the inner scouts in civilian form on top. The bottom also features the same words that are on the front cover. The back is cardboard with lineart style chibi’s of the inner scouts again. Below them are the words “Pretty Soldier Sailor Moon S” in Japanese, as well as the Seika Note copyright information. Another Seika note book. The front features all 5 inner senshi, as well as Chibi Moon. It also reads Pretty Soldier Sailor Moon SuperS in Japanese, as well as copyright information in Japanese as well. There’s also a small oval that says the note book would have sold for 100 yen. 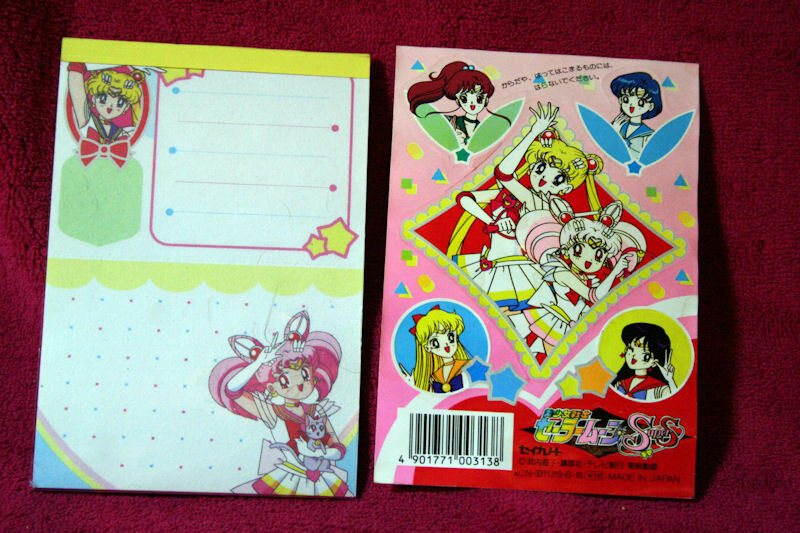 The front page is actually a clear plastic cover that lifts to reveal the senshi page is actually a page of stickers. Below that are several pages of 2 designs, which are separated by perforated paper. The back is blank. 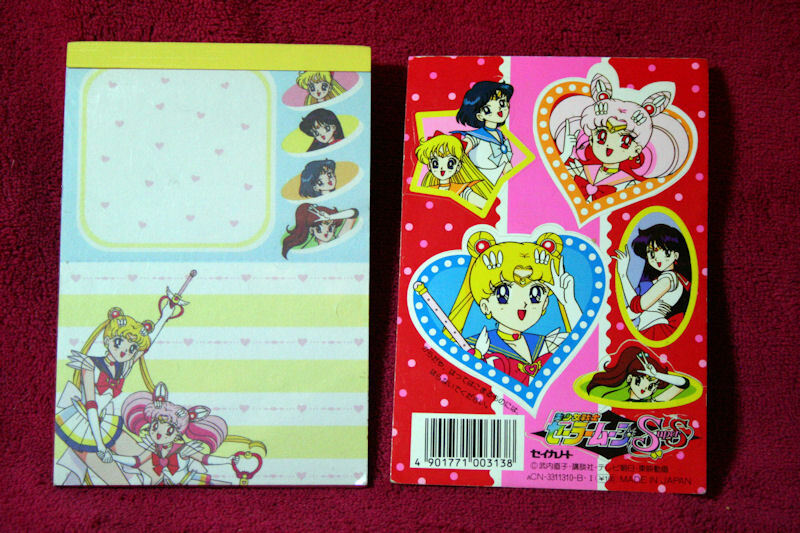 This is an official Seika Note Sailor Moon spiral notebook. It is based off of the SuperS season and features all 5 inner senshi on front, as well as Super Sailor Chibi Moon. Inside the book features Super Sailor Moon, as well as Super Sailor Chibi Moon again. 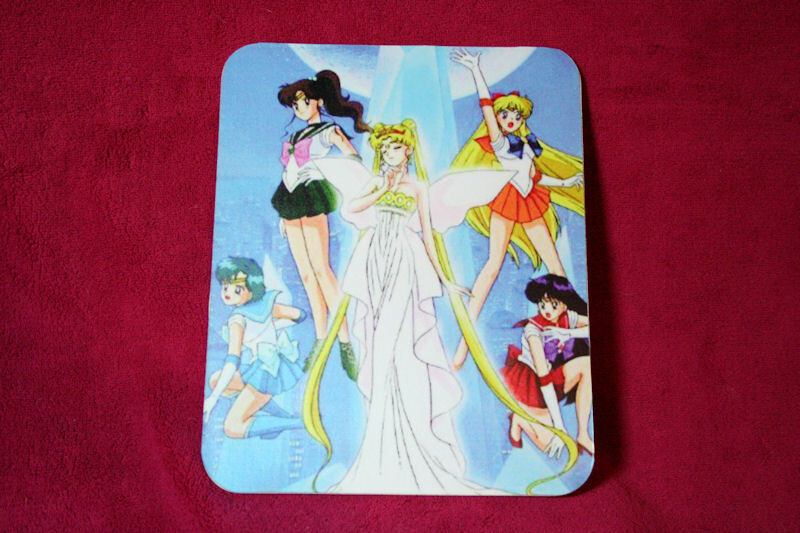 The back shows Tuxedo Kamen, Sailor Mercury, Mars, Super Sailor Moon, Chibi Moon, Artemis, Luna and Diana. Both the back and front display proper credits in Japanese. Paid: $1 at Harufest in 2010. This is another sticker and note pad combination similar to the others above. 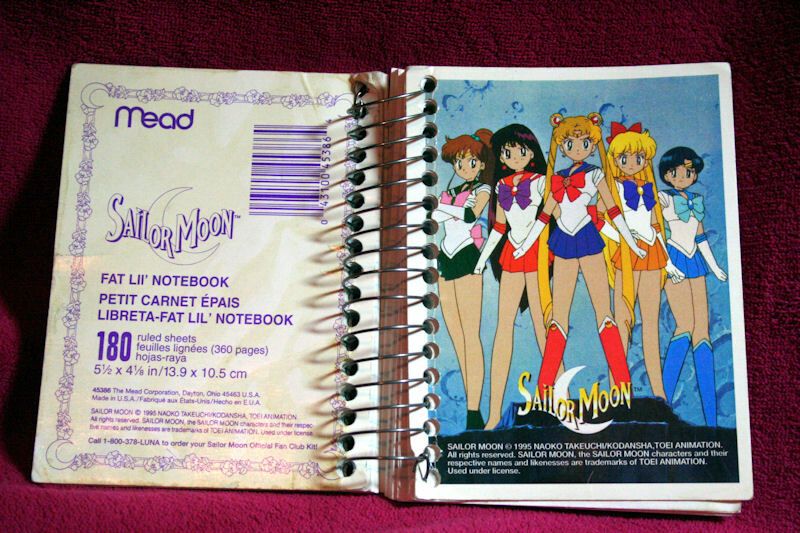 This particular book of note pages was created for Sailor Moon R.
This particular note book is from a series of school supplies using the same image. They were typically sold in stores similar to Wal-Mart or Zellers. The inside of this particular book is just light blue ruled lines. Eraser came with a stationary lot that I got for $20. Above mouse pad is bootleg. Paid $7 for it from a vendor at a convention.